The building of PT658 was completed on July 30, 1945, at the Higgins Industries Inc. manufacturing facilities in New Orleans, Louisiana. 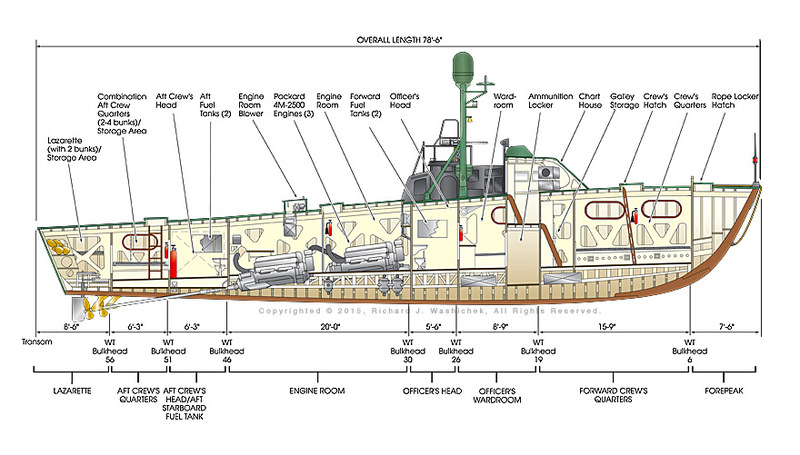 The illustrations on the following pages depict the Higgins 625 Class PT boat, built between December 1944 and August 1945. 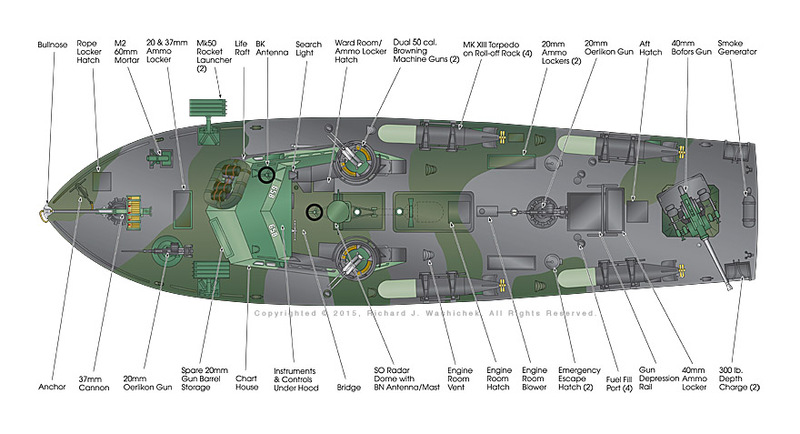 Although the end of the war came before PT658 was outfitted with its armament, the following drawings illustrate the typical armament that would have been installed. Three 5M-2500 Packard-Marine V-12 Engines. These engines are 4 stroke, water cooled, 60 degree, V-type with a 6-3/8” bore and 6-1/2” stroke, for a total of 2490 cubic inches of displacement. Each engine has 48 valves, 2 inlets and 2 outlets per cylinder. Cylinder compression ratio of 6.4:1, and are fitted with a gear-driven centrifugal supercharger and intercooler. The engines are installed with a Holley 1685F aircraft-type carburetor, The engines develop 1850 hp at 2500 rpm. Maximum revolutions at 3000 rpm. Engine weight is 3100 pounds. Four fuel tanks (2 forward tanks at 800 gallons and 2 aft tanks at 700 gallons each) with a total of 3000 gallons of 100-octane aviation gasoline (AVGAS). Range varied depending on overall operating speed. Typically 12 hours or 520 miles could be expected with engine speed limited to 2000 rpm/35 knots cruising speed or 6 hours with maximum rpm/42+ knots top speed. 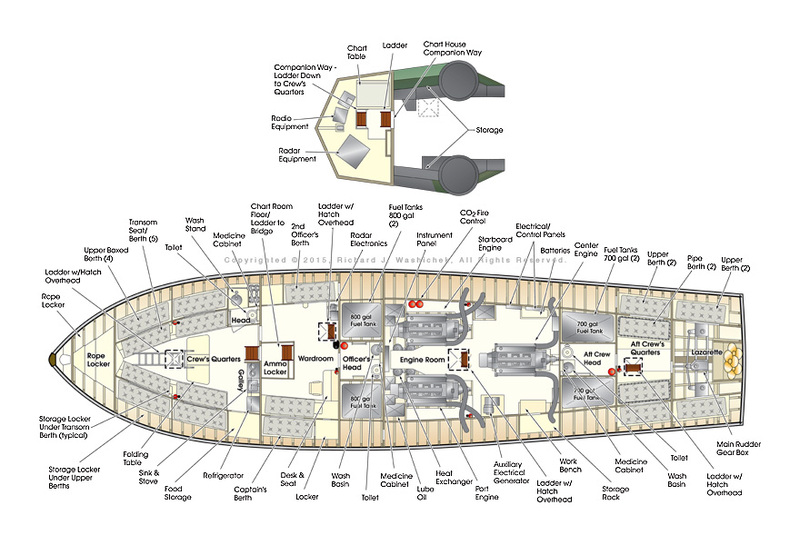 - Deck, Plan View . . . .
- Profile View . . . .
- Section, Longitudal View . . . .
- Below Deck, Plan view . . . .
- Typical Late War Amament . . . .
One 40mm Bofors M3 cannon: 4 round clips, 130 rpm, muzzle velocity 2890, range 5420 yards, 2 lb projectile weight. One 37mm Oldsmobile M9 auto-cannon: 30 round magazine, 125 rpm, muzzle velocity 2000 fps, range 8875 yards. Two 20mm Oerlikon M4 cannons: 60 round magazine, 480rpm, muzzle velocity 2740 fps, range 5500 yards. Two .50 cal twin Browning M2 machine guns: belt fed, 550 rpm, muzzle velocity of 2930 fps, effective range to 2500 yards, maximum range 4.2 miles. Air cooled, recoil operated. Gun length 61.5 inches, 24 inch barrel, gun weight 84 lbs. Two .30 cal Browning 1919A4 machine guns: belt fed, 500 rpm, muzzle velocity of 2700 fps, effective range to 2000 yards. Air cooled, recoil operated. Gun length 41.11 inches, 24 inch barrel, gun weight 31 lbs. One 60mm M2 Mortar: a smoothbore, muzzle-loading, high-angle-of-fire weapon with bi-pod, base and sight. Caliber: 60 mm (2.36 in), Elevation: +40° to +85°, Traverse: 7°, Rate of fire: 18 rounds/minute, Muzzle velocity: 518 ft/s, Maximum firing range; 1,985 yards. Four Mk XIII aircraft torpedoes: (warhead 600 lbs) 22.5 inch diameter, 13’-6” long, 33.5 knot speed, weight 2216 pounds, range 6300 yds (3.5 miles). Filled with 2800 psi air, grain alcohol and water to run a steam turbine, turning gear operated counter rotating propellers. Used Mk8 contact exploder. Two Mk VI depth charges, containing 300 pounds TNT and 420 pounds total weight, mounted on Type C Roll-Off racks. Sinking rate of 6 feet/sec Detonator pistol manually adjustable between 30 and 600 feet. Two Mk 50 rocket launchers for designed for Mark 7 or Mark 10, 5-inch diameter spin stabilized rockets. Range 11,000 yards. Small arms: Two Thompson .45cal SMG and two M1A .30cal Carbine two 1903 Springfield .30-06 Rifles, ten .45 cal Auto Pistols. One Mk VI Smoke Screen Generator: 35 gallon, refillable with ”FM” compound smoke (titanium tetrachloride). The gas release generates dense white smoke as a defense. PT658 News . . . .
To see news about the PT658 please continue on to the News link in the Navigation bar or click here.